Bright and flavorful, pan seared chicken breasts get tossed with green olives, lemon and fresh herbs then is finished in the oven. Perfect served with bread or a green salad on the side. From the One Pan and Done Cookbook, by Molly Gilbert, this book is filled with easy, flavorful recipes with minimum cleanup. 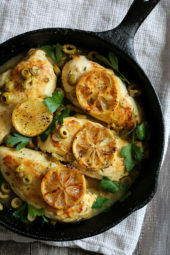 Chicken breasts cooked in a skillet with green olives, lemon and fresh herbs. Preheat oven to 400F with the rack in the center position. Heat the oil in a 10 inch cast iron skillet over medium-high heat. Season chicken with salt and pepper then sprinkle with flour. When oil is hot, sear chicken about 3 minutes on each side. Add garlic, wine, lemon zest, lemon juice, thyme and olives. Top with lemon slices if desired, transfer the pan to the oven and bake about 10 minutes, until 165F in the center. Serve hot topped with parsley. Delicious! I pulled the ingredients out and handed my BF the recipe and said dinner was his to make. He followed the recipe exactly, Everyone loved it. Will definitely make again. This one got five stars from my picky husband, but only 4 from me. I had to play with the seasonings, wine and lemon to get it to have enough flavor, but it seems like, by the time I got there, it was a tad too briny for me. My husband absolutely loved it and said, “this is fantastic, a definite do-over.” I served it with spinach, lemon quinoa on the side and added chopped artichoke to the dish. I will definitely do it over again and perhaps back off on the olives and lemon juice for my personal taste. So good! My kids love it. I used 1/2 cup of wine and 1/4 lemon but it seemed to be way too much liquid and almost poached the chicken. Any suggestions or just use less of each? i have made this several times now. It’s a huge hit in our house. 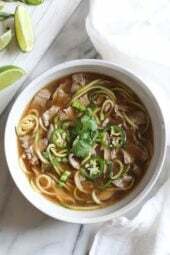 It’s super easy and flavorful! I made this tonight with just a couple of changes. The only olives we had were stuffed with garlic and jalapenos – so I used them. Our breasts were 11 oz so took another 10 minutes to come to temperature.We served over quinoa with a side of your oven roasted garlic broccoli. YUM! !We were pleasantly surprised. I would make this again, probably with smaller cuts of meat.try it! My husband is very fussy and always balks when I make a “DIET” meal but he has loved everything that I have made from skinny taste. I made this tonight…..delicious !! I used some blue cheese stuffed olives and capers mixed in with the cup of olives. i will be putting this in my meal rotation. Thanks !!! Fabulous and so easy! I just had to remember to pick up fresh thyme at the grocery store. Loved it with rice and fresh green beans. My family does not like olives, so I omitted them. This was awesome! Tender chicken. I cooked it longer than your directions. Seared for maybe 6 min on each side and 15 minutes in the oven. Thanks for helping me understand my cast iron pan. Made this last night and my family and I LOVED it!! Followed the recipe exactly (expect for adding a tiny bit more lemon zest and lemon juice…as we LOVE lemon flavor!) My husband was skeptical because he doesn’t like olives; but LOVED this! So did my 6year old daughter! Will definitely make again! Thank you! Just delicious and so simple. I did not have green olives so I used Greek. The juice was super and went great with quinoa and sala.d. Will try again with green olives. I made this tonight and served it with Parmesan orzo, it was AMAZING! I used two large chicken breasts and sliced them in half to make thinner cutlets. It got my husbands seal of approval as well. This is definitely going into my rotation. Easy and delicious – had to double it, but it worked out great! Hi Gina. I made this tonight and it was delicious. My son ate 3 pieces. I just want to check on the olive quantity. A cup seems like too much. I used way less and still threw some out. Thanks. 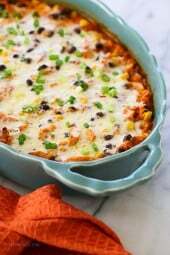 My family and I love your recipes!! I love meals like this-easy to prep, easy ingredients, rustic presentation, and a blast of bright flavors & Mediterranean tastes!! I just made this recipe and it is delicious! Thank you Gina for creating so many fast, healthy dinners, Skinnytaste is a favorite for my whole family. Made this for dinner and it was delicious! We served it with farro and roasted fennel. Such a great and easy recipe. Thank you Gina! I am getting 13 smart points per serving??? ANOTHER HOMERUN! Didn’t have thyme, subbed with oregano. I don’t eat chicken, but the rest of family was left wanting more!!!!! It’s quick and easy, no fuss, no mess! Any thoughts on adding prunes? My mom made something similar to this when I was young, and added prunes. It was divine, but I’m not sure how the lemon will react with the sweet? Another delicious recipe Gina – thanks so much!! Didn’t have pitted olives on hand, but did have olive tapenade left over from a different dish so I used that & it worked beautifully. Love the depth of flavours with the white wine and lemon juice & olives. Will be adding this to my rotation. I am trying this recipe tonight. I added mushrooms. Did not have lemon zest. And no cast iron skillet either. I transferred all to a Pyrex baking dish. Will it still be done in 10 minutes? do you think black or kalamata olives would work as well? OMG, those Skinny Taste pictures have me drooling!!! They look awesome! And you still can lose weight eating such heavenly food? Hi Gina – another one of your recipes that we love! Made this last night as my wife loves the chinese takeaway version but I’ve been eating on the lighter side so have been looking for compromise meals. We both devoured this! So tasty. I made this for dinner tonight and it was FANTASTIC! My kids even loved it. My pickiest child asked for seconds and that is something hard to accomplish. My 11 year old said it’s “the best chicken she’s ever had”. She usually dips all chicken and pork in honey mustard, tonight she said this was too good for honey mustard! Thanks for a great recipe! I made this last night and it was a huge hit! I love how decadent it tastes when I reality it’s so simple and quick! We had it with a big Greek salad and a little rice, the only change I made was to add more garlic! Thanks for another winner Gina ???????????? Glad you enjoyed it Cassandra! Does that cookbook you mentioned list the calories per meal? No it doesn’t, also I lightened the dish up on my own. did I not have the heat high enough? It was still delicious but didn’t look like yours. Put the recipe in My Fitness Pal and it came out more than double what you have unless I increased the number of servings (4 oz chicken). Please check the calories. Glad you added the emon zest and lemon slices to the recipe. New to cast iron. Chicken didn’t brown. Not sure whether this is due to too little flour (1/p2 tsp) instead of 2 tsp or too low heat in the skillet. Any thoughts? I noticed the 1/2 (cup) of dry white wine also. When I put this recipe into my fitness pal the calories came in at more than double yours unl;ess I cut the chicken to 4oz per serving. Please verify the calories. The skillet should be very hot. Interesting about the calories, I will verify. Be sure you calculate with raw chicken breast or it will be much higher. You must use a cast iron skillet!! I made this last light and it was awful and it was my fault. I did not use a cast iron skillet, I used a regular stainless oven proof pan. The lemon and wine reacted to the pan resulting in a bitter mess. I made tonight. really easy and delicious! I am wondering if I should have covered the dish when placed in oven? all liquid evaporated. About how many capers would you try to replace the olives? Do you take the seared chicken breasts out of the pan while mixing in the garlic, wine, lemon juice, etc. and then put them back in? Can you use other types of olives? Any suggestions on what to serve with this? The author suggests salad or bread. I think orzo would be nice! Can you tell me how to make if I don’t have a cast iron skilllet? Any oven safe skillet would work. Are these skinless breasts? Thanks! One pan meals are right up my alley! The only food I don’t like is olives, so I plan on subbing capers. Thanks for all the awesome, healthy recipes, Gina. Capers would be delish! I would use less since they are saltier. Going to try this for sure. Is it 1/2 cup of dry white wine? Yes, I use what I drink, in this case it was Sauvignon Blanc. How much wine? 1/2 what – cup? bottle? cup, sorry I will fix! I know I will love this! Hi, wondering what I can substitute for the 1/2 C of white wine? 1/2 what white wine? There is no amount in the ingredients. Thanks. Just saw your comment for the amount of lemon zest! Thank you! This looks so good! Didn’t see the lemon zest in the ingredient list so I may have missed it. How much do you use? Thanks for such great recipes! Sounds tasty! Do you really mean 1/2 tsp flour for the whole recipe? That does not seem like much. Hi Gina, thank you, this recipe looks great. Do you have any tips to recommend for purchasing a cast iron skillet pan? I have wanted to have one for a while, it seems necessary for many recipes. Thank you! I have my Dad’s, it’s over 50 years old. You can buy them at antique shops, or Lodge also sells them. The main thing when you purchase one is to season it before using it. You can google it to get more info. Thank you Gina, I really appreciate it. Btw, my family loves your slow cooker turkey w/gravy recipe, and they are not easy to please! Thank you!❤️? Lodge is a great and inexpensive brand — Amazon, Target and Walmart sell 12 inch cast iron skillets for under $30. This looks like it’s going to be my new favorite dinner! The instructions state lemon zest. How much lemon zest is added? Not listed in the ingredients. It’s 4 x 8 oz (so 32 total), which is why the smart points are so “high”. 8oz is too much for me also, so I plan to make 6 servings with the ingredients listed (instead of 4 as indicated in the recipe). I was thinking the same thing – 351 calories for this sort of thing with no sides is high. Making it 6 servings is a good solution. Thanks Valerie! This sounds really good. I’m a big fan of lemon chicken but would never have thought to add olives into the mix (which I also love). Looks like a perfect weeknight dinner to serve up with a salad. I never thought of olives either, but I did think about trying this with artichokes as well. Can’t wait to try. 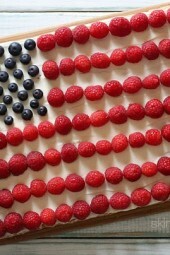 This looks great but I can’t see the recipe! Substituted lime for lemon and cilantro for parsley. Still delicious. Served over cauliflower rice. Mmm good!